The Rose City Accordion Club, located in Portland, Oregon, is a non-profit organization comprised of individuals who share enjoyment of and enthusiasm for the accordion. 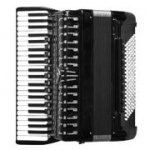 The Club embraces all styles of accordion music and welcomes all who have an interest in the accordion whether they play or not. Our intent is to promote the future of the accordion and the enjoyment it gives to all.